Why Do People Buy Cars That Are Not The BMW 3.0CS? There are many cars in this world, and a significant percentage of them are not the BMW 3.0CS. This is somewhat troubling. The BMW 3.0CS (called the E9 in BMW’s chassis code) was the Bavarian company’s grand touring car built from the mid ‘60s through the mid ‘70s. If you’re looking for specs, here’s what I can tell you. Barring the early four-cylinder quasi-predecessors, these cars came with overhead cam straight six engines with 120 to 200 horsepower (in this case a 3.0 liter with something around 170). Weight was a bit over 3100 pounds, disc brakes were all around on later cars, and the suspension was all independent with MacPherson struts at the front and somewhat snappy semi trailing arms at the rear. Zero to sixty took around nine seconds and the top speed was supposedly 130mph. That makes these cars about as fast as, uh, a Ford Escape taxi cab. If you’re looking for a complete history of the car, don’t go to Wikipedia. Go to Ate Up With Motor, which has an absolutely fantastic discussion of how the car started life growing out of BMW’s rebirth in the 1960s that established the terms of the company continuing today. More than anything else, perhaps, is how BMW basically built the perfect car with the E9 coupes. It did its job perfectly. It was pretty to look at from the outside, pretty to look at from inside. It was engaging to drive and it was comfortable. It was stylish and it was desirable. It was technically advanced but still easy to own. From the perspective of the company as a business, the E9 coupes could not have been better. But you and I are not BMW. We are human beings. And the E9 is even better for us. BMW built these cars for a solid decade, and churned out tens of thousands of examples. Though they look as good as any contemporary Ferrari, Maserati, Aston Martin, or whatever other exotic of the time, these BMWs are within the financial means of mere mortals like ourselves. A guy with a two car garage and a set of tools could own one easily, as could any guy with a healthy retirement plan and a good relationship with a local import car mechanic. I spotted this car just the other day in a leafy neighborhood in Brooklyn. The owner has done some work on the car and he’s kept the interior in absolutely fantastic shape. Even then, though, it’s still something that sees some use. The paint is far from new car shine. The metal brightwork around the front and rear has some age to it. But that’s good. This particular car is 42 years old. It should show a little age. That means that the owner doesn’t have to worry about every scratch or every pothole. The car can be used, still. You can’t say that of more high-priced cars of the era. Prices seem to vary quite a bit (eBay’s completed listings shows results from $20-80k), and that makes sense. These are cars you still see parked on the street with a few patches of rust here or there, and they’re cars you see at the top concourse events in the world. BMW showed off a racing-car-for-the-road 3.0 CSL at Villa d’Este at Lake Como the other day. These E9s are just about perfectly proportioned, with just enough charming little details to be interesting but not too many to be overdone. They have a good name, and they have a good pedigree, racing successfully in FIA endurance racing in Europe through the ‘70s. The first BMW art car was a 3.0 CSL painted up by Alexander Calder for one of his gentleman racer buddies at Le Mans ‘75. Hard to get a better history than that. 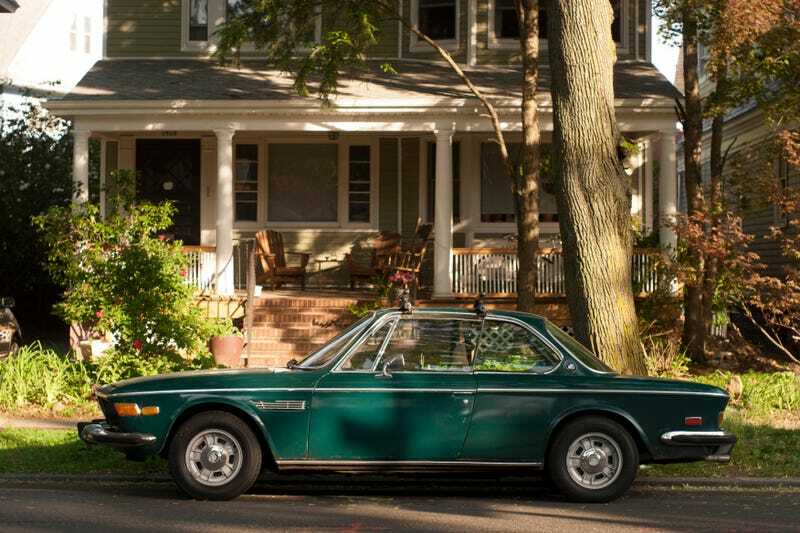 So why would you buy a car that isn’t a BMW E9 coupe? What possible justification could you have?